hardy souls braving hostile environments and facing untold challenges with near-mythic grit and gumption. Our imaginations swirl with visions of horse-drawn plows and kerosene lamps and, if we're really honest, we don't really think we'd want to go back to those "good old days," because we know they were really ... terrible. Then again ... were they? I love this photograph of a homesteading family. I imagine the guy in the center providing music for church socials and barn dances. "In the winter time, no matter how cold the weather, we would bundle up and climb into the straw-filled lumber wagon, with plenty of quilts and blankets and drive to Uncle Will's. . . He lived in a sod house and his two sisters, Laura and Lydia kept house for him. Lydia played the violin and could dance and jig with the best of them. Will and Steve and Lydia played for dances and I used to 'chord' for them on the organ some times." Here's a photograph I took at a museum of a portable organ. Who knew such a thing existed! "There were only ten women and forty men and we danced all night, and the men nearly danced us women to death." " ... at a Calico Ball, the lady made a calico dress and a necktie to match it. The men were given a bunch of neckties and asked to choose one without seeing the lady whose dress it matched. In this way, original partners were selected." Sod house homeowners lucky enough to have a wood floor would sometimes put all the furniture outside to make room for dances. Apparently it wasn't unusual for someone to play the prank wherein babies asleep on a bed were re-bundled and, in the wee hours of the morning when the dance broke up, mothers simply took up the familiar blanket (who would have thought to check to see if the baby was the right one?!) ... and at some point on the way home or the next morning discovered they had the wrong baby! The anecdote I read about this incident closed with the line, "it was two weeks before the neighbors got all the babies traded back." I could almost hear the story-teller laughing. "George and I precipitated an acquaintance with Dr. and Mrs. Purdum ... they lived in a dugout with a sod roof on which grew tall sunflowers and through which they thrust their stovepipe and in driving one Sunday afternoon we drove upon the roof and our pony stepped through before we knew we were on their dugout. A profound apology cemented our friendship." Maggie Oblinger Sandon remembered, "Winter evening we would play Authors or Dominoes or Checkers. Dominoes were home-made out of an empty soda box, cut them out and do our own marking of the dots. . . Authors were our delight and it taught us so many of the old-time authors and what books they had written. . . . "
Sunday drives and calico balls ... dances no matter the weather ... Authors and Dominoes and Checkers ... and a mention that "twenty miles isn't so far to drive" all remind me that while twenty-first century life may be stressful, there's value in taking time to have a little fun, too. We can think back on those times and think how hard or bad things were, but in reality it's all they knew, so they were happy. At any time in history, you live in that moment, not missing something that hasn't come along yet...ie electricity, cars, tv, etc. It only sounds bad to those who look at where we are today and compare the two time periods. Am I making any sense?Thanks for sharing...love the picture. Very good point. Perspective makes such a difference. My dad was a prankster, and I had to chuckle at the baby swap, but then I realized how awful that would be because you wouldn't know who had your child. I also wondered if all of the people in the picture above lived in the house behind them. Thanks for an interesting post! 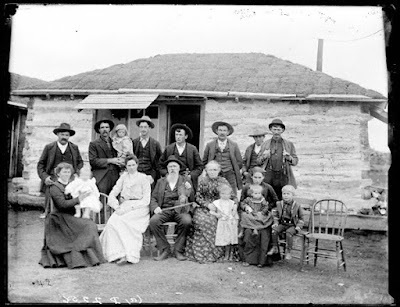 Maybe it's extended family gathered from neighboring homesteads for the photo ... but that's the fun and frustrating thing about this old photos ... we don't know, we want to know ... so some of us make up a story ;-).